There are lots of instant messengers and voice-over IP software available to use today and Skype is one of the most popular with more than 300 million monthly active users. While Skype comes with features you’ll normally find in a standard instant messaging app such as text chat, file transfer and screen sharing, it is primarily a VoIP service that is more focused towards video and voice calls. Skype to Skype calls are free while calling mobile or landline numbers are charged at affordable rates. Skype is an excellent VoIP software that can make clear and crisp video or voice calls, but it lacks of an important feature which is the ability to record calls. This is a disadvantage to professionals who want to use the free Skype to Skype calls for conducting video/audio interviews, meetings, conferences, one to one online training, and even consultation. Actually the call recording feature is available in Skype for Business which is a part of Office 365. Business plans require paid subscriptions per user with annual commitment. If this business plan isn’t suitable for your needs and you just want Skype for free with recording capabilities, here are 3 third party applications for Windows that can record Skype video and voice calls for free without limits. 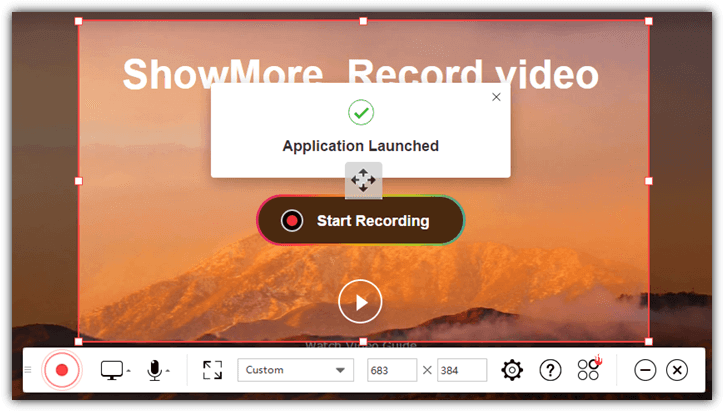 ShowMore is actually an online screen capture recorder app created and offered for free by Apowersoft Ltd which can be used to record anything that is displayed on your computer screen. By further configuring ShowMore audio input as system sound and microphone, you get to capture both video and audio at the same time giving you the complete recording of Skype video and voice call. 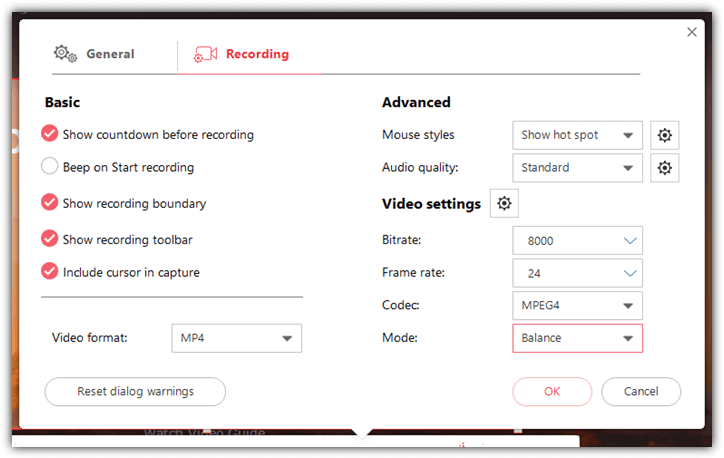 To record Skype video calls with ShowMore, you’ll have to visit ShowMore’s website and click on the Start Recording button. If it is your first time running ShowMore, you’ll be prompted to go through a one time download and installation of the online launcher program. Once finished installing the launcher, the ShowMore recorder application will launch and you’ll notice that the background is all grayed out except the rectangle box. The control toolbar located at the bottom of the recorder screen allows you to start/stop recording, selecting the video and audio source, fullscreen or custom recording dimension and access to program settings. 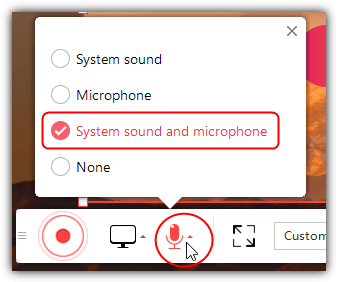 It is important that you click on the microphone icon on the toolbar and select “System sound and microphone” otherwise the recorder won’t be able to capture any sound from the Skype call. In the settings, you get to change the keyboard shortcuts to stop/pause/resume recording, show/hide recording toolbar, changing the output directory, include/exclude cursor in capture, choosing from 8 different types of video format (MP4/WMV/AVI/MOV/FLV/MPEG/VOB/ASF), changing video settings and even mouse styles. Once ShowMore recorder application is launched, you can call your friends or families using Skype and then start the recording. ShowMore is not a fully automated Skype recording tool that detects a Skype call and automatically records it. Each time you want to record a Skype call, you’ll need to manually launch the tool from ShowMore’s website and start the recording. There may be slight video quality loss due to screen recording and not directly capturing the raw video data from Skype. It is, however, free and can record Skype video and voice call without limits. Callnote is a powerful video and audio call recorder that comes in two versions which is the Premium (free) and Pro (paid). 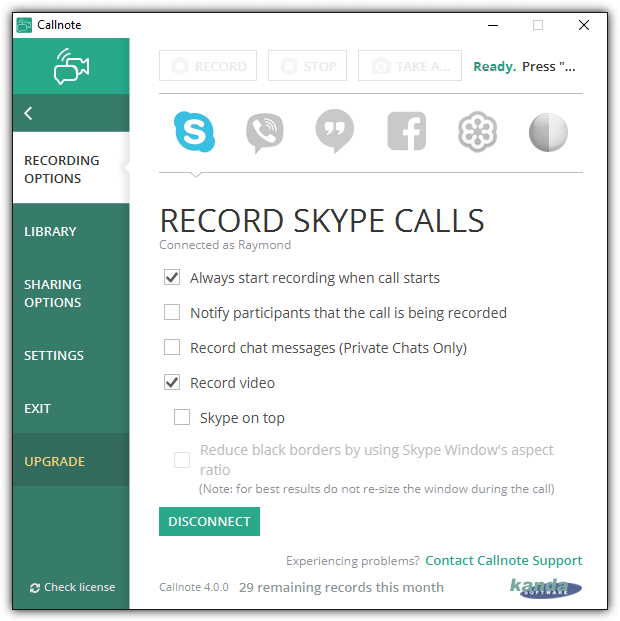 Not only can Callnote record Skype video and audio calls, but also support recording calls from other programs such as Google+ Hangouts, GoToMeeting, WebEx, Facebook and Viber. You can also find sharing options in the program to automatically send the recording to Evernote, Dropbox, YouTube, Facebook, Gmail and OneDrive. 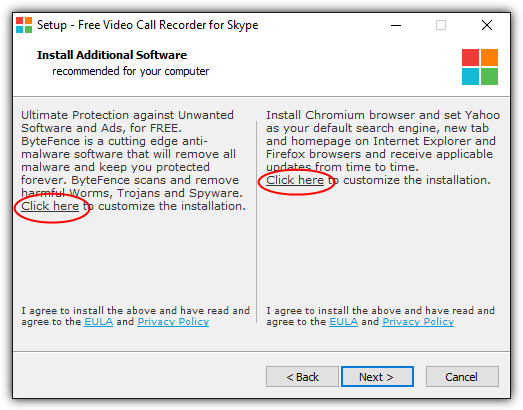 Interestingly, Callnote works out of the box after installation and doesn’t need to request access to Skype that requires the user to click on the “Allow access” button. When Callnote is running in the background, it can auto detect if a call is being made by Skype and immediately starts recording. A small control window appears when Callnote is recording where you can pause/stop the recording and take a snapshot. While you can use Callnote Premium to record a Skype video or audio call as long as you want, you are however limited to only 30 recordings per month. 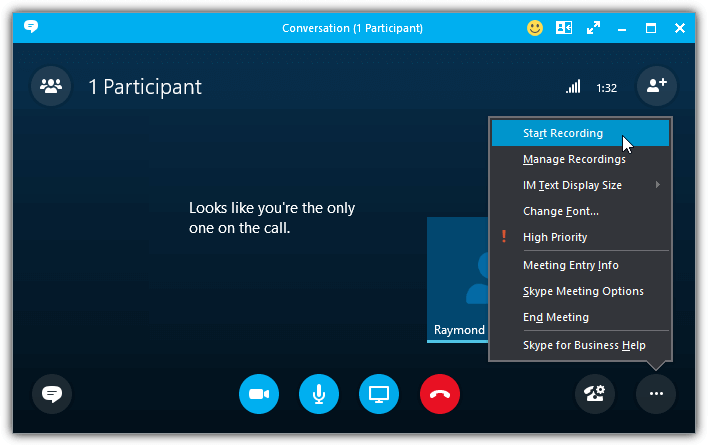 Unlike most of the other Skype call recording shareware tools like Evaer, SuperTintin or Pamela for Skype, they can be used as many times as you want but each recording is limited to only 5 minutes. If you’d like to record more than the 30 times per month, you can always register a new account and login to Callnote with the new email address to get another 30 recordings. This program is created and offered for free by DVDVideoSoft to record Skype video calls without any limitations. Do take note that this program will only start the recording when the other party has turned on the video. So if you’re on a Skype voice call, you will have to manually change the recording mode from the main graphical user interface to “Record audio only”. What we really don’t like about this program is the official webpage claims that the program contains no spyware or adware whatsoever. If you run the installer, you’ll notice that it will attempt to install two unnecessary “additional software” applications which can only be bypassed by clicking the “Click here” links and unticking all checkboxes. Obviously the development of this “freeware” is funded by adware. If you must try this application, we’ve managed to obtain the direct download link to the program so you can avoid running the installer that is wrapped with bundle pushing adware. 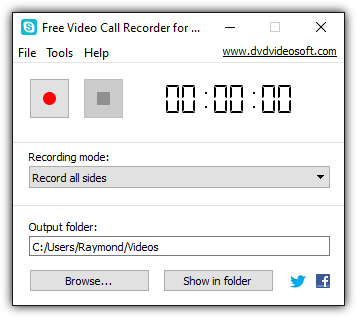 Final notes: There are 6 other Skype call recorders which we’ve also tested but did not include to the list because iFree Skype Recorder, CallGraph Skype Recorder, Amolto Call Recorder for skype and MP3 Skype Recorder can only record audio calls but not video calls. As for Messenger Plus for Skype! and Skype Auto Recorder, both of this program doesn’t work at all with the latest Skype. I tried all of them. One of the best is from dvdsoft skype free video call recorder. But this is not working with windows 10. It is perfect for windows xp. The rest of the apps have no good quality recording and charges more. For example Evaer recording audio and video in two seperate files. so one can either listen to recording or watch video without audio. It seems all these apps are from the same person with different names. For example if you click PrettyMay or supertintin, it takes to Talkhelper site. Talkhelper in itself is very bad. Great article. I almost didn’t clock through from my google search result because the image in the search showed the Skype window with Start Recording clearly highlighted, while the text below it said you can not record audio or video. But once I did click through to read the article, I did see that you differentiated between free vs. paid Skype versions. Hi, Raymond. Thanks for taking the time for making this tutorial, really appreciated. I always use Acethinker Screen Recorder to capture skype video calls, It’s a free web-based application to record computer screen right from the browser, share it here as an alternative to showmore. There is a free tool shipped with the OS named Quicktime.